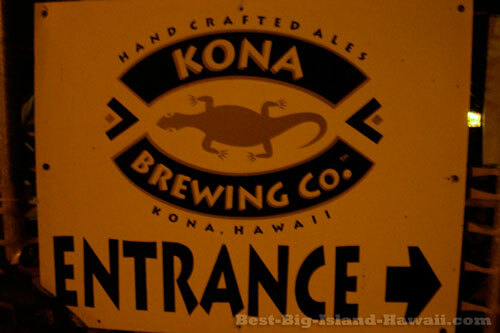 Kona Brewing Company has been around since 1995 when they began brewing beer in Kailua-Kona. Since then they've expanded their brewing operation and bottles of Longboard Lager and Pipeline Porter can be found on supermarket shelves all around the US. But there's no substitute for the original location tucked away off the beaten path not far from downtown Kona. This Kona brew pub is one of the best of its kind anywhere. You wouldn't think that one of the best patios (or lanais) in Kona would be hidden away in a retail plaza but you'll find they have a huge outdoor seating area surrounded by tiki torches and lush greenery that makes it stand out from your typical patio that's just a haphazard extension of the restaurant that feels like you're sitting in the parking lot. About a dozen specialty beers are usually available on tap including some varieties that are draft only and seasonal specials that rotate in and out of the draft lineup. From the hoppy Castaway IPA to the smooth Longboard Lager, there's really something for every beer drinker's palette. Growlers are available for taking your favorite brew to go. The menu features a great blend of local specialties like kale pork and various seafood creations to standards like wings and nachos. They use a lot of fresh local ingredients and the quality definitely comes through in the final product. I love their pizzas, especially for sharing. I love stopping by for a late dinner after dark or nighttime snacks and beers. 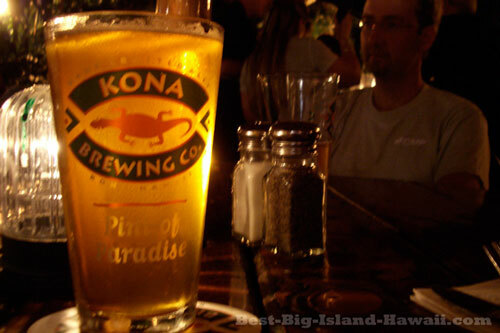 Definitely one of the best Kona restaurants and an essential stop for fans of craft beers. Big time beer fans might also want to check out their brewery tours. Check out the Kona Brewing Company website for the full menu, location, hours and special events. © Best-Big-Island-Hawaii.com — All rights reserved.